Mountaineering Camp | Welcome to the High Life! Do you have a taste for real adventure? Then join us at one of our annual week-long summer Mountaineering Camps! Based out of the Alpine Club of Canada’s picturesque Asulkan Hut high up in east-central British Columbia’s beautiful Selkirk Mountains, we’ll spend a week in the high alpine at the south end of Rogers Pass in Canada’s spectacular Glacier National Park learning alpine climbing skills and, if conditions permit, climb a glaciated peak. This camp is open to all youth aged 11-17. No previous experience is necessary. MCamp is most certainly an “adventurous journey” and can be used towards all levels of the Duke of Edinburgh’s International Award! MCamp also qualifies as a “Residential Project” for the gold level Award. If you are working on the Bronze, Silver or Gold level DoE Award, let us know and we’ll be pleased to help you with your Award submission (bring your Record Book to MCamp). 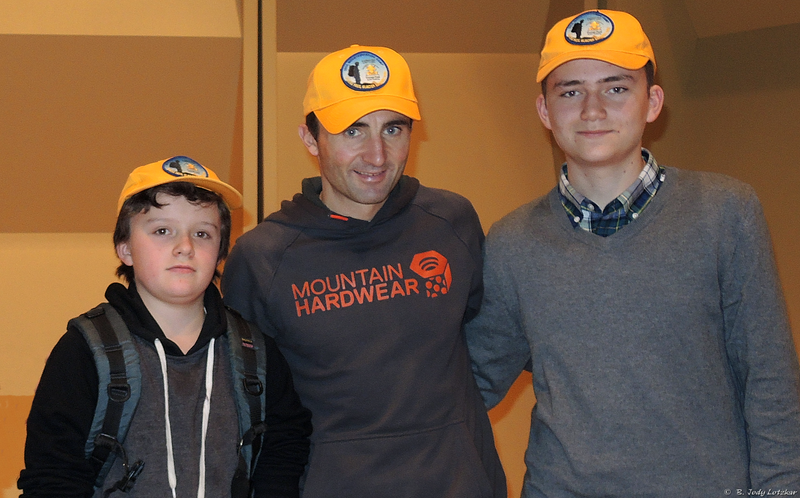 World famous climber Ueli Steck “The Swiss Machine” (speed ascents of the Eiger Nordwand and Annapurna South Face) sporting one of our 2014 Mountaineering Camp team hats (with Mountaineer Scouts Keir and Simon). 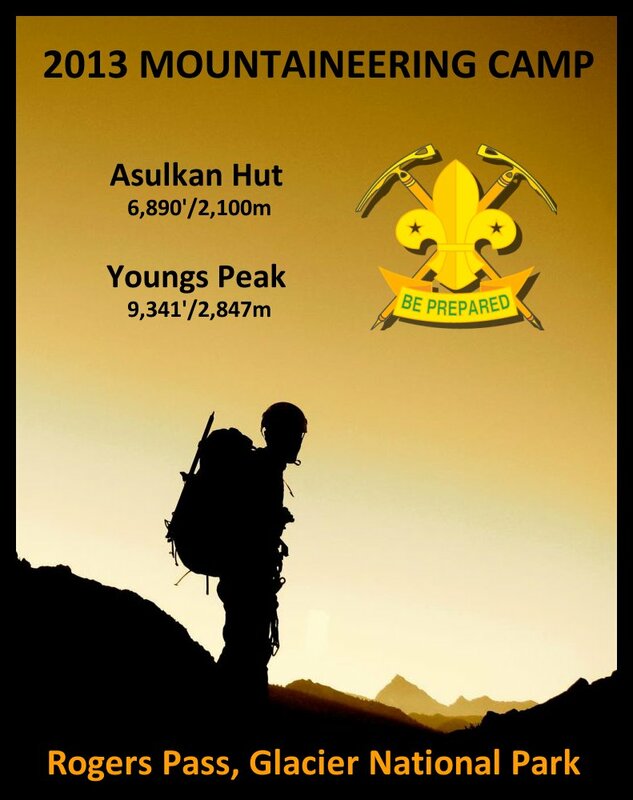 The Asulkan Hut (6,890 ft./2,100 m.) accommodates 12 (3 adults and 9 youth participants). 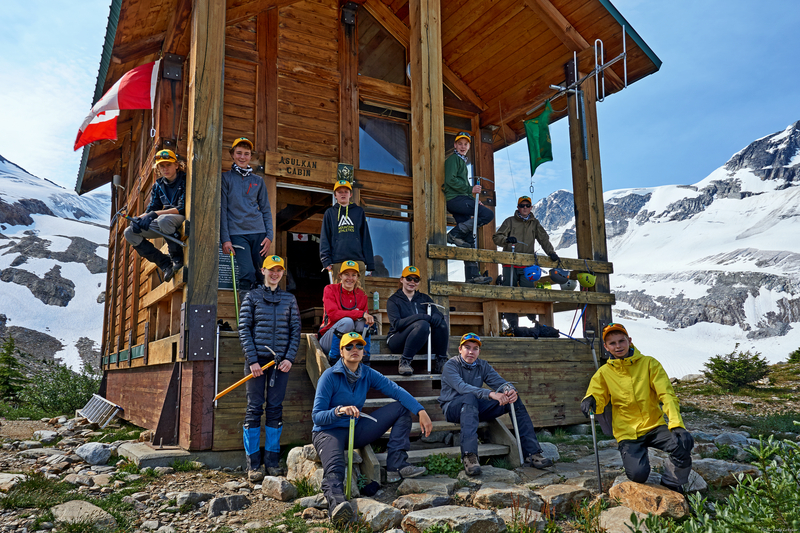 The participants at the 2015 Mountaineering Camp: Rogers Pass are ready for a week of alpine adventure! Seven of the team came from Ontario and five came from British Columbia. We book the cabin for our exclusive use and do a multi-day (8 days/7 nights) basic mountaineering camp on the slopes behind it (i.e., training, conditioning and acclimatizing in stages higher up the mountain each day) culminating with an ascent (conditions permitting) of Youngs Peak (9,235 ft/2,815 m). On the first day we meet and stay at the ACC’s Wheeler Cabin (4,100 ft./1,250 m.) located beside the Illeciliwaet (pronounced illy-sil-la-wet) camp ground parking lot (Glacier National Park) and rest and get to know the team after our journeys to Rogers Pass before heading out the next morning for the high camp. The trail head starts from the Wheeler Cabin. It’s a spectacular 7 km. hike in to the Asulkan Cabin with a 2,790 ft./850 m. elevation gain (the majority of which is done in the last kilometre or so on the narrow spine of a glacial moraine that winds up the slope to the hut). We have all day to hike in. The trail rises gently along the floor of the Illeciliwaet and Asulkan Valleys surrounded by towering peaks, past avalanche paths and waterfalls before starting the ascent through a subalpine forest, culminating with the hike up the glacial moraine to the Asulkan Cabin. 2013 team members take a break on their way up to the high camp. 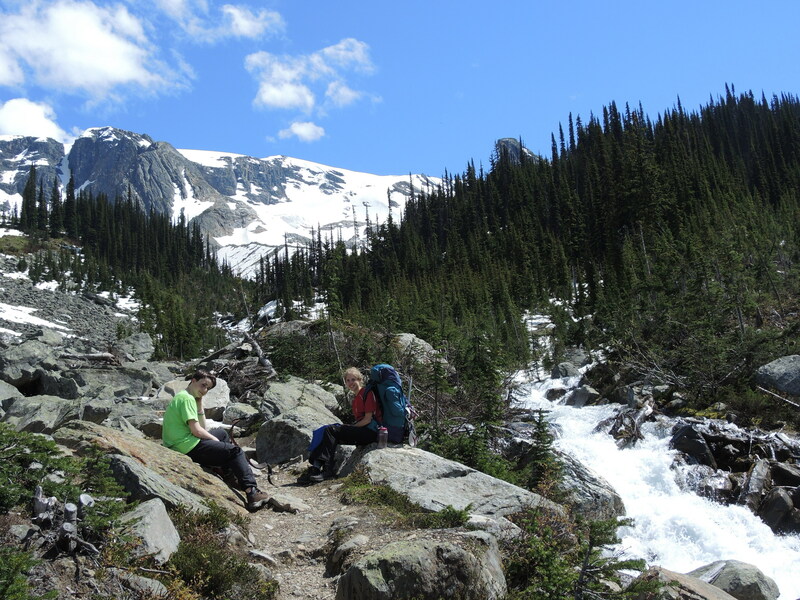 Stories, photos and videos from the 2013 Mountaineering Camp: Rogers Pass can be found here! Who wants to go on a real adventure? Hi we are from Edmonton 116 lynnwood scouts and would be interested. For some reason I could not find the dates. Could you forward that information? The dates are now on the “Participants [by year]” pages (access using the drop down menu under the “Registration” tab). How much for the Rogers Pass trip? Costs and other details are on the “Registration” page. I was wanting more details if possible. I would love to be able to come and do this or both my daughter and I. We are with a scout group here in Red Deer. When is this camp, cost, is it run only once during the summer? Any details would be awesome. The camp is for youth (we have room for 9 youth and 3 adults). We let adults come if they are bringing 2-3 youth with them. All of the information you asked about is in this website. Take some time and explore around it. We have one week set aside for a girls only camp and one week for a co-ed camp. What group in Red Deer are you with? We had three people from Red Deer attend in 2014 (18th Morrisroe). Let me know if you need any more information after you’ve had the chance to explore the website. I looked at the Registration page and see the $200 deposit but do not see what the remainder of the fees are above the deposit. Sounds like an excellent opportunity! How do I contact you to deliver the letter.